In the grand scheme of history our medical devices will (hopefully) seem quite primitive to people of the future. And if we make as many advances in the future as we have since the 1920s, we'll all be cybernetic demigods in no time. We can do incredible things to extend life here in the early 21st century. Organ transplants are old hat, pacemakers are ubiquitous, we're 3D printing windpipes, and mind-control over robotic limbs is showing tremendous promise in the laboratory. Today we have an incredible amount of ways to help people live longer, healthier, more productive lives — provided you can afford it. But back in the 1920s, augmenting the human body with anything more than eyeglasses and a set of false teeth was seen as wild science fiction. 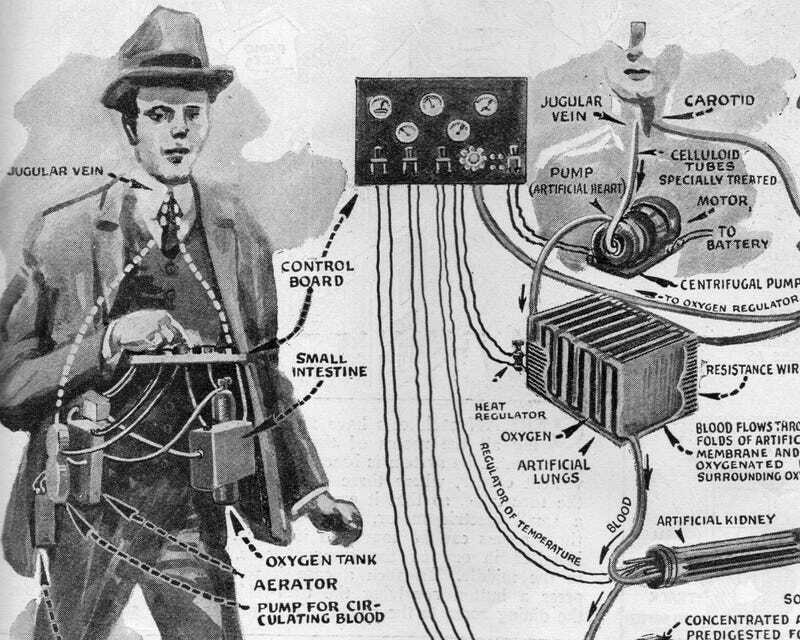 The November 1924 issue of Science and Invention magazine included this illustration of a Jazz Age cyborg. The man had a battery-powered control board from which he could regulate his artificial kidney, artificial heart, and even his artificial small intestine. The magazine described the goal of developing what they called the "artificial man" of tomorrow: "Removing the fangs of death by substituting organs of the body which have succumbed to the effects of time and the ravages of disease." Everything from internal organs to eyes to artificial limbs were promised to be somewhere just over the horizon so that humanity might fight off the ravages of time. While some of these advancements are still to come, let's just be thankful that the microelectronics revolution miniaturized that bulky control board. And that they didn't set the Six Million Dollar Man in the Coolidge administration. Be sure to click on "expand" for a larger view of the page from Science and Invention.